Dr. NTR UHS hereby notify that the first and final verification of certificates for Web Based Counseling will be conducted for Admissions into MBBS/BDS Courses in Colleges under Dr. NTR UHS, Vijayawada. The candidates those who have appeared and secured ranks in NEET UG 2017 are directed to attend the counseling for admission into MBBS / BDS Courses for the academic year 2017-2018 into the Andhra Pradesh Medical and Dental Colleges including Statewide colleges in the Andhra Pradesh State at any one of the following Help line Centers as per the schedule given below. 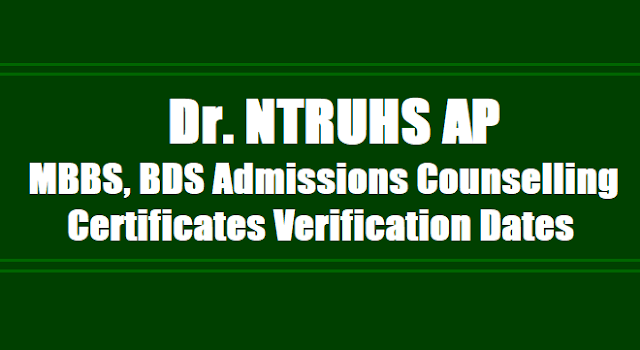 Dr.NTR UNIVERSITY OF HEALTH SCIENCES: A.P: VIJAYAWADA Notification for First and Final verification of original certificates (web based counseling) for admission into MBBS / BDS Courses for the academic year 2017-18 under Competent Authority quota seats in Government and Private Un-aided Non-Minority, Minority Medical and Dental Colleges and MBBS Course in Sri Padmavathi Medical College for Women (under SVIMS),Tirupati in the state of Andhra Pradesh Dr. NTR UHS hereby notify that the first and final verification of certificates for Web Based Counseling will be conducted for Admissions into MBBS/BDS Courses. The candidates those who have appeared and secured cut off ranks in NEET(UG)-2017 and figured in the provisional merit list of candidates displayed on 13.07.2017 in the website of Dr. NTR UHS are informed to attend for verification of original certificates for the academic year 2017-18 into the Government, Statewide Colleges, Un-aided Non-Minority, Minority, Private Medical and Dental Colleges under Dr. NTR UHS and MBBS Course in Sri Padmavathi Medical College for Women (under SVIMS), Tirupati at any one of the following Help line Centers of their choice as per the schedule given below. The Telangana Candidates those who are seeking admission inun-reserved(15%) and State wide quota seatshave to attendto help line centers5 and 6 (JNTU, Hyderabad and PGRRDistance Education Center Hyderabad.) only asconcerned officials ofall the welfare departmentsofTelanganaStatewill beavailable at both the Hyderabad centers. Note:The following special categories verification isatDr. NTR UHS,Vijayawadacenter only in addition to General verification.The candidates who have applied under NCC and Sports & Games are directed to attend on the specified time and dates for both General and Special category certificates verification. The orders issued by the Government from time to time with regard to admissions into MBBS/BDS courses will be applicable. Certificates to be produced at the time of counseling: The candidates are directed to bring all the original certificates (mentioned below) and three sets of Xerox copies.The selections into MBBS/BDS will be through Web allotments which will be notified separately. 1. The candidate should be an Indian National or Person of Indian Origin (PIO) / Overseas Citizens of India (OCI) Card Holder and should satisfy the Local or Non-local status in Andhra Pradesh (Residence requirement) as laid down in Andhra Pradesh Education Institutions (Regulations of Admissions) Order, 1974. Selection will be done as per the procedure laid down in the G.O.P.No.646, dated 10.07.1979 as amended in G.O.Ms.No.42, Higher Education (EC2) Department,dated 18.05.2009. 2. The candidate should have passed Intermediate (10+2 pattern) or its equivalent examination with Physics, Chemistry, Biology (Botany, Zoology) / Biotechnology and English. ·OC candidates should obtain not less than 50% marks in science subjects. ·BC/SC/ST candidates should obtain not less than 40% marks in science subjects. ·OC PH candidates should obtain not less than 45% marks in science subjects. 3. The candidate should have qualified in NEET – 2017 and secure the following cut off score. 4. The candidate should have completed 17 years of age as on 31-12-2017. The candidates who do not complete 17 years as on 31-12-2017 need not attend the counseling. The candidates born on or after02-01-2001are not eligible for admission into MBBS/BDS Courses. 5. The candidates who wish to claim seats under Anglo Indian, Sports & Games, CAP (Army), NCC,Physically challenged (PH) and Police Martyrs Children (PMC) also need to fulfill the above eligibility criteria. (k) The candidates claiming fee exemption shall produce the latest Income certificate of the Parent issued by MRO /Tahsildar/Ration card. (l) Undertakingin the form ofAffidaviton Rs. 100 /- Stamp paperwhile theParent and candidate stating that thecasteand areamentionedin thecertificatesare genuine andthey will beheld responsiblefor any further consequencesas per LAWif any discrepancynoticed. (m) Local status certificate issued by MRO for claiming as AP local as per Circular No. 4136/SPF&MC/2015-5, dated.08.08.2016 (Children of employees migratedTelanganato Andhra Pradesh). (n) Candidates claiming eligibility of reservation under Special categories i.e., CAP, NCC, Sports & Games, PH, PMC and Anglo Indian should furnish therequired certificate in support of their claim on the day of verification of original certificates for special categories as per schedule given. Candidateswill not be allowedfor verification without producing original certificates.Custodian certificateswill not be allowed under any circumstances. Candidates those who are having caste certificates issued byTelanganaState, should attend for verification of their certificatesat PGRR Center, OU Campus, Hyderabad and JNTU, Hyderabad. III.Candidates those who are having caste certificates issued by the State AP, should attend for verification of their certificates at any of the remaining four centers (Dr. NTR UHS, Vijayawada, Visakhapatnam,Tirupati&RayalaseemaUniversity, Kurnool). OC candidates can attend at any one of the seven centers of their choice. (Hyderabad, Vijayawada, Visakhapatnam,Tirupati& AndhraLoyalaCollege). Only candidates shall appear for the verification of certificates in person as per schedule notified.Proxies are not allowed. VII.Candidates please note that this is the first and final phase of verification of original certificates. No further phase of verification of certificates will be done. But, candidates who got verified their original certificates can only exercise their web options in the subsequent phases for allotment if any. VIII.Mere attending to the verification of certificates does not confer any right for a seat as more number of candidatesarecalled than the number of available seats.